Do you know who embroidered this sampler? A colour photograph of a needlework sampler of Ontario Ladies' College made by a student with the initials M.I.D. in 1935. A needlework sampler is a piece of embroidery that was used to demonstrate a student's skill in needlework. 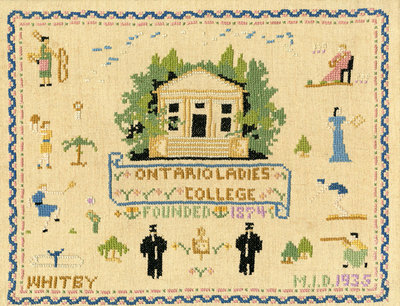 Sampler of Ontario Ladies' College, 1935, M.I.D. Whitby Archives A2013_011_001.